CARLSBAD, Ca. (September 23, 2015) – Upper Deck, the leader in authentic memorabilia and premium collectibles, has agreed to a deal with Allen Robinson for an exclusive line of signed memorabilia. The agreement grants rights to Upper Deck to produce a line of authenticated memorabilia that spans Robinson’s record-breaking days at Penn State to his current budding career with the Jacksonville Jaguars. Upper Deck will now be the exclusive source of authentic signed Robinson home and away jerseys, autographed footballs and autographed helmets. In addition, the company has created an impressive collection of high quality signed images that capture some of Robinson’s greatest moments. The announcement comes just days after the Jaguars’ 2nd year receiver stole the spotlight with two huge touchdowns and several major plays, including a colossal 52-yard play that earned the team a big win over the Miami Dolphins and solidified Robinson’s role as Jacksonville’s go-to guy. In his previous career at Penn State, Robinson set school records in single-season receptions and receiving yards. He also holds the title for the second-most overall receptions in school history. 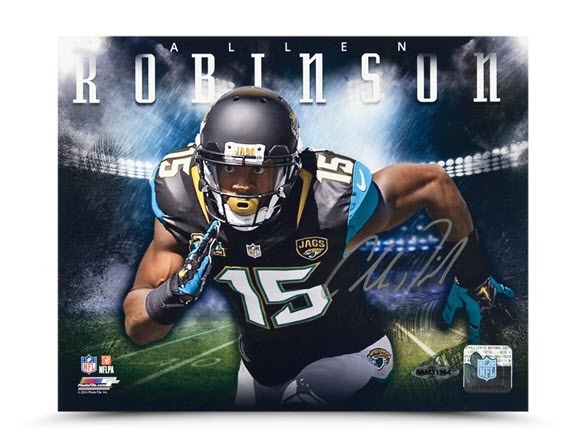 “We are excited to add Allen Robinson as an exclusive signer for Upper Deck. He had an impressive career with Penn State and is already off to an incredible season with the Jacksonville Jaguars,” said Jason Masherah, President of Upper Deck. The new collection of Allen Robinson autographed memorabilia is available exclusively from Upper Deck and can be viewed at http://upperdeckstore.com/Allen-Robinson. Upper Deck, headquartered in Carlsbad, Calif., is a worldwide sports and entertainment company built on the pillars of quality craftsmanship, authenticity and innovation with a dedication to creating products that turn memorable moments into collectibles. Upper Deck is home to the world’s greatest athletes, including Michael Jordan, Wayne Gretzky, Tiger Woods and LeBron James.